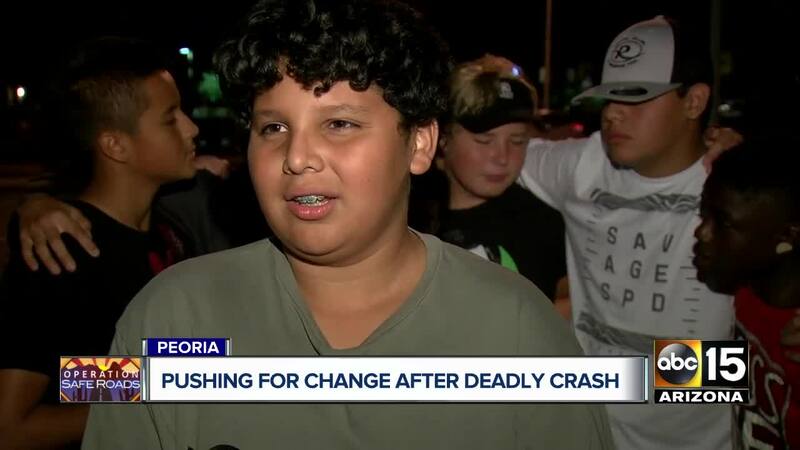 A Peoria resident is pushing for change at an intersection following a deadly crash Wednesday that left a 12-year-old boy dead. Peoria police are investigating a deadly crash involving a child pedestrian on Wednesday. The incident occurred on Wednesday afternoon near Santa Fe Elementary School at 75th and Peoria avenues. Police say the driver of a pickup truck was headed eastbound on Peoria Avenue when an 11-year-old boy ran across the street in front of the vehicle. The child was taken to the hospital for treatment where he was pronounced dead. Some residents like Victoria Carranza say they are planning to take action to make sure this doesn't happen again. "It's a dangerous street because no one ever wants to go the crosswalk over here or over there," she explains. Because of that, she's planning on asking the Peoria City Council to look into placing more crosswalks here. "I don't think should ever happen again," Carranza said. This incident marks the 70th known pedestrian fatality in the Valley so far this year. Officials say the driver stayed on scene and cooperated with the investigation. Police do not believe impairment was a factor. No arrests or citations have been issued.